Healing the inner child helps us develop a more positive personality, balanced emotions and greater spiritual connection, as well as creating powerful soul growth. 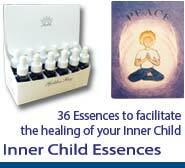 Shimara has created these 36 beautiful flower & gem essence combinations to facilitate the healing of your Inner Child and to help you return to the radiance of your pure, true self. There is also a set of Divination cards to accompany this set.